One of the pleasures of working with the Autry’s library and museum collections is discovering a book, document, or object you haven’t seen before. 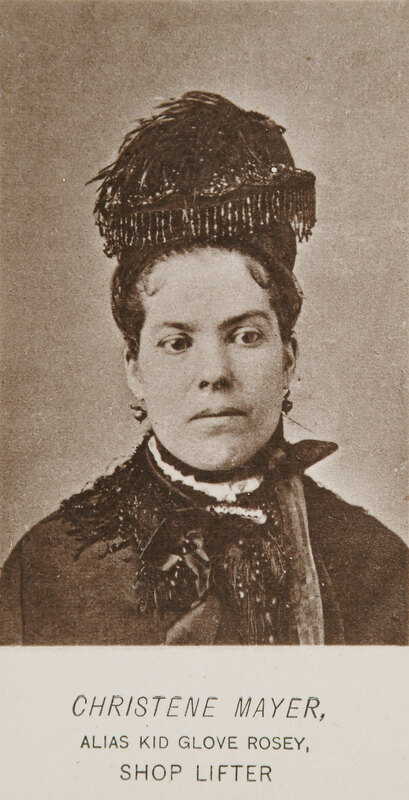 One day, while looking for images of 19th century women, I came across this image of “Kid Glove Rosey,” the alias of Christine Mayer, “shoplifter.” What a great name for a shoplifter! I had to know more about her and how her image found its way to the Autry’s collection. I discovered that a Western book and artifact dealer donated this and 24 other similarly formatted images of male and female criminals in 1991. Neither the catalog record nor the information files kept for each acquisition revealed anything more about these photographs, so I turned to Google. Kid Glove Rosey, it turns out, was arrested in New York in 1880 with Black Lena, one of the other shoplifters in this collection. Both were in possession of stolen fabric and served time for shoplifting in the penitentiary on Blackwell’s Island. Now, this was getting interesting! Since there were more hits for Black Lena than for Kid Glove Rosey, I followed the links to Lena’s story. Finally, I found what I think is the source of these images and a most interesting book—Professional Criminals in America by Thomas F. Byrnes (1842–1910), Inspector of Police and Chief of Detectives, New York City, copyrighted in 1886. Thank you, Google Books for providing access to the contents! Thomas Byrnes understood that criminals relied on anonymity for their success and feared public identification, so he compiled thousands of photographs of criminals during his career and promoted their use in detective work. He included over 200 of these photographs in his book, hoping to reach an audience beyond law enforcement. In the chapter titled “Descriptions and Records of Professional Criminals,” I found information and images for each of the 25 criminals in the Autry’s collection. I soon realized that the images we hold are exactly the same as those in the book, down to the sizes and captions. Since our catalog describes these as gelatin silver prints, I wondered if we held the original photographs. Or were these reproductions sold for advertisement or made as collectibles? My next step was to look at the physical evidence. When I took the first image out of its acid-free envelope, it was clear that it was not an original photograph. Furthermore, it appeared to be taken right out of the book. I asked the Autry’s Chief Conservator for help. Using a stereomicroscope, he determined that the Autry’s images are indeed photogravures and likely did come from the book. Below are the lady shoplifters, pickpockets, and sneaks of the group with brief excerpts from their descriptions in Professional Criminals of America. For more detailed information, go to the page number in the book found under each photograph below. Thirty-nine years old in 1886. Born in Germany. Married. Housekeeper. 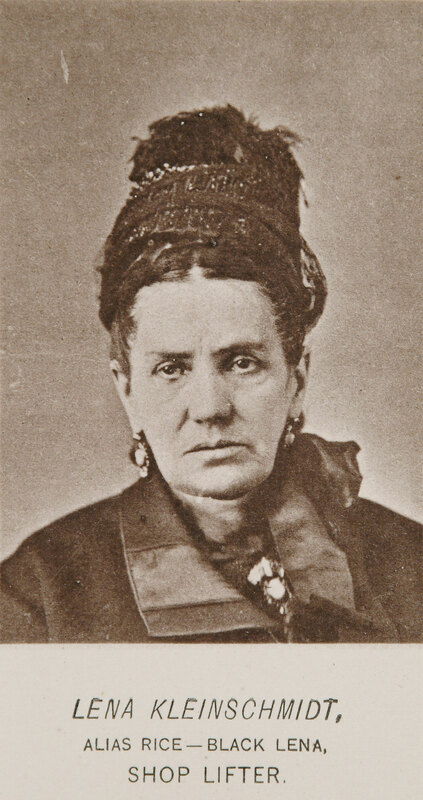 Fifty-one years old in 1886. Born in Germany. Married. Housekeeper. Stout build. Height about 5 feet, 5 inches. Weight about 150 pounds. Wrinkled face. Fifty years old in 1886. Born in Ireland. Single. Very fleshy, coarse woman. Talks with somewhat of an Irish brogue. A well-known New York pickpocket, shoplifter, and prostitute, and a coarse, vulgar woman who would stop at nothing to carry her point. Forty-two years old in 1886. Born in Ireland. Married. Housekeeper. A remarkably tall, thin woman; big lips. She is very quick in her actions and difficult to follow. Thirty-six years old in 1886. Born in France. Servant. Her specialty is to enter a hotel or flat and wander up through the house until she finds a room door open, when she enters and secures whatever is handy and decamps. Professional Criminals in America by Thomas F. Byrnes (1842–1910), Inspector of Police and Chief of Detectives, New York City, copyrighted in 1886. Click here to see all 25 images in the Autry’s collection.